For a PDF brochure of this product click here. 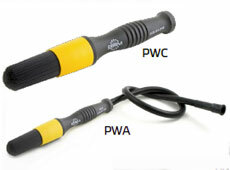 Injection molded Polypropylene handles, synthetic filaments for resistance to solvent cleaners. All metal parts are either stainless steel or brass for corrosion resistance. These are superior tools that will make each and every job easier and faster, saving both time and money. A totally new concept in parts washing brushes. The ergonomic handle design reduces wrist fatigue. 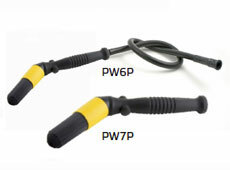 Made with Polypropylene handles with synthetic filaments to resist solvent type cleaners. Both brushes incorporate a unique flow control system that allows you to control the amount of cleaning fluid desired. The large brushing area of the PW-1P makes the cleaning of large areas faster and easier than ever before. 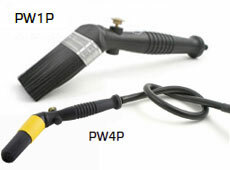 The PW-4P is designed for the automotive brake mechanics. 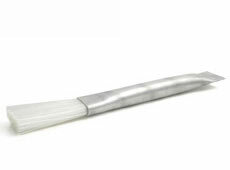 Available in a 3/4" width, this economy parts wash brush in made with polypropylene filament crimped into a non-flow thru aluminum handle which includes a scrapper handle. This versatile, inexpensive brush is our most popular.